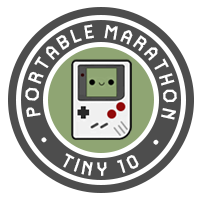 The Portable Marathon started out as an in chat joke between runners/streamers back in 2014 during the weeks leading up to one of the Best of NES marathons. As we felt it was sad that GameBoy games didn't get appreciated as much as other platforms, this joking around eventually lead to making an actual marathon. Shortly after the announcement of PM#1, participants started calling it the Tiny Ten, as opposed to the Big Twenty name the NES marathon achieved. Although the official name still remains the Portable Marathon, calling it the Tiny Ten has become a staple in the community. Although the first two editions of PM/TT consist solely of original GB games, later editions will include GBC, and GBA. The main purpose of the marathon is to spread the love for these portable gems and to make the platform become more popular in the speedrun community. There isn't a requirement to register in advance. An hour or two before the actual marathon will start, we will open a racing room on the SpeedRunsLive IRC channel for everybody to join. We will close entries 20 minutes before the start. To qualify for entering the race we do suggest having the ability to be able to stream (for restreaming purposes on our end) and to have an actual SRL account. If you still want to play together with everybody without meeting these requirements, feel free to do so of course! We are always looking for volunteers who are willing to help out with whatever they can. If you feel you can help a hand with any of the following things, please let us know. Have a million followers on your channel or on your twitter account? Help spread the word about the marathon! Get people to watch or even join the race. Use our custom made promotion material (coming soon) to spice things up and get everybody aboard the HYPE train. Choo, Choo! You can also help out by making a logo, advertisement poster, banner, stream skin, ... Anything you can think off. It's better to have multiple people work together on stuff like this so we can give each other feedback and improve. If there is any other role you think you can perform in helping out, please let it be known!